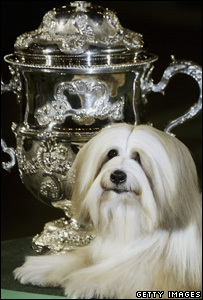 A Tibetan Terrier called Willy has been named Best in Show at the 116th annual Crufts dog show. The six-year-old, whose full name is Araki Fabulous Willy, won the award at the NEC in Birmingham on Sunday. Willy is owned by John Shaw and Neil Smith of Gloucester, who said winning the prestigious title was "the biggest accolade you could ever wish for". More than 25,000 dogs and 143,000 visitors attended the event, which opened on Thursday. Mr Smith, 48, breeds dogs and also owns a boarding kennel in Brockworth, near Gloucester. He said: "We may have to think about retiring him now because there is nothing left for him to do." Willy's handler, Larry Cornelius, from California, said: "It was definitely worth the trip, he has won the breed here four times in a row, but it's the first time I've shown here. "He's done everything I've ever asked of him, and I think he is a truly fabulous dog in every way." A one-year-old wire haired Fox Terrier called Peggy from Bristol won second place in the contest.